Coggeshall takes one of the many snaps he's received as the quarterback of the Colonials. Shrewsbury – Mike Coggeshall, the junior quarterback, has his team at 3-3, which is good enough to be in a four-way tie for second place in Division 1. With the field wide open, Coggeshall and the Colonials look to make a Super Bowl run. How&apos;s the football season going so far? What&apos;s it like to be a quarterback at this level? Are you comfortable running the offense? Who&apos;s your favorite target in the offense? 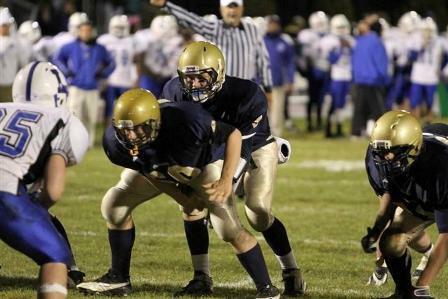 As a freshman, did any older players help you get accustomed to Shrewsbury High School&apos;s (SHS) football? You&apos;se a three-sport athlete – football, basketball and baseball. Which is your favorite to play? Can you see yourself playing a sport in college? Which one? Have any college coaches reached out to you yet? Which coach has helped you most develop as an athlete? Which game in your high school career has meant the most to you? Which NFL quarterback do you look up to most and why?